Apollo-Push In-Line Check Valves may be installed in both horizontal and vertical flow with upward flow, but not for use in reciprocating air compressor service. They are designed for easy connection to Copper, CPVC, or PEX tubing. The Lead Free Apollo-PushTM 61LF Series BALL-CONE® check valves with Push end connection offer reliable protection against reverse flow in a variety of fluids including potable water, using proven ASTM quality materials made in the USA. 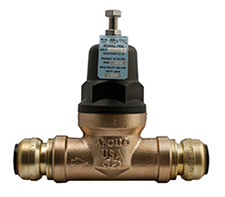 The Apollo-PushTM 61 Series BALL-CONE® check valves with quick push connection offer reliable protection against reverse flow in Domestic cold water applications using proven ASTM quality materials made in the USA. The Apollo 36ELF and 36E water pressure reducing valve is now available with Apollo-PushTM direct connectors. Combining the features, performance and economy of the Apollo 36E family together with proven TECTITE push-fit technology, these lead free regulators feature fast and simple "push to connect" installation. Suitable for use with copper, CPVC and PEX tubing. The dezincification resistant bronze body, stainless steel adjusting screw and dielectric polymer cage provide maximum corrosion resistance. Designed for easy in-line servicing with simple cartridge removal. The Lead Free APOLLOPUSH® 59LF Series Strainers with quick Push connections are designed to protect potable water systems from unwanted foreign particles with minimum pressure loss. The valves are built for long reliable service with proven ASTM grade materials including a Lead Free bronze body and a large area stainless steel screen. 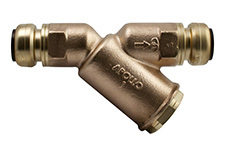 The APOLLOPUSH® 59 Series Strainers with quick Push connections are designed to protect piping systems and process equipment from unwanted foreign particles with minimum pressure loss. The valves are built for long reliable service with proven ASTM grade materials and a large area stainless steel screen. 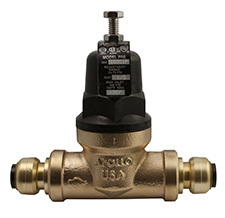 The Lead Free Apollo® 78-RV Series Combination Water Heater Isolation Valve/ IAPMO approved Thermal Expansion Relief Device solves two Code requirements while saving time, installation space and money! Proven TECTITETM push-fit technology with fast and simple "push to connect" installation. 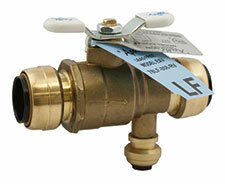 Ideal alternative to expansion tanks in residential plumbing systems. Made in the USA, featuring Lead Free dezincification resistant brass materials.